Uckfield house fire. Framfield Road. Photo by Eddie Mitchell 13-05-18. Firefighters are carrying out salvage work after a fire at a home in Sussex earlier this morning. Five fire crews were called in to help after reports of smoke and flooding at the property in Framfield Road, Uckfield. Part of Uckfield High Street remains closed this morning following the house fire, with two fire crews still on scene. A spokesperson for East Sussex Fire and Rescue Service said no one had been hurt. 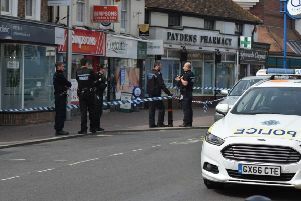 She said: “Firefighters from Bexhill, Uckfield, Lewes, Crowborough and Brighton all attended and on arrival there was smoke issuing from the roof. “Crews used six breathing apparatus, foam, one jet hydrant and an aerial ladder platform. The road closure is Framfield Road, listed as High Street (B2102) both ways between Alexandra Road and High Street, near Buxted station.